An important aspect in the fabrication of ceramic coatings using colloid-based techniques is the preparation of a stable suspension. In this study, we attempted stabilizing MgB2 dispersed in different liquid media; acetone and methanol. Our batch settling experiments show that minor addition of iodine in MgB2 dispersed in acetone is enough to prolong the settling of the powder. However, iodine addition in methanol did not show any improvement in prolonging the settling and dispersion of MgB2. The morphology of the EPD-fabricated coatings from iodine stabilized MgB2/acetone (AI) and MgB2/methanol (MO) suspensions are studied by scanning electron microscopy. Surface images show the presence of large voids and cracks with poor arrangement of particles on coatings deposited from MO. This is largely attributed to the poor powder dispersion in methanol. On the other hand, a homogeneous and dense coating was obtained from deposition using AI owing to the better stability and dispersion of MgB2 in iodine stabilized acetone. Particle size analysis reveal that large agglomerates dominate in count on MO coatings while small individual particles are mostly observed on the coating produced from AI. X. Galapia and R. Sarmago. 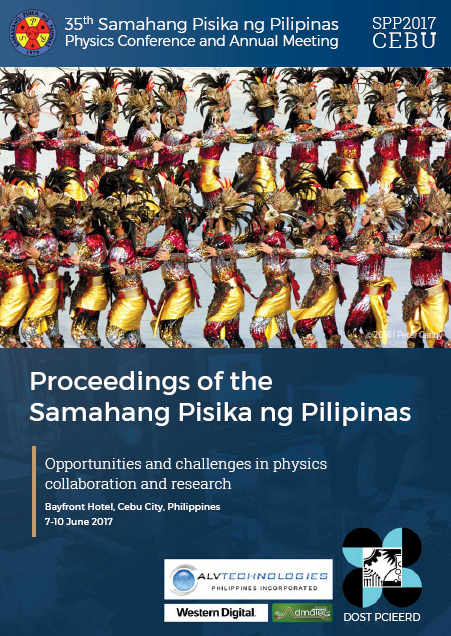 Examining the morphology of electrodeposited MgB2 coatings dispersed in methanol and iodine-stabilized acetone solution, Proceedings of the Samahang Pisika ng Pilipinas 35, SPP-2017-PA-07 (2017). URL: https://paperview.spp-online.org/proceedings/article/view/211.